Further to the sketch of the hinged flap design in post #50, an illustrated example - see pix. One of the flaps during construction; the factory building can be removed separately. The layout part with flap in place, without terrain but still with factory, and without factory. I did a flap/trap door on my last layout, though I felt the joins were too prominent - though it was just chipboard. I see it can look a lot better though, thanks for the pictures! I love this layout. It's the perfect balance of realism to MMR idealism IMHO. It looks good, but it's not super prototypical. Nothing feels out of place as a result, just right! I'm totally going to steal that flap idea for a couple of areas of my layout. Ok, not Maerklin, but a German classic. Rolf Ertmer (died 2004) was a trained photograph who built with his wife three legendary numbered layouts. Here the track plans of Repabahn II (Repa = Rolf Ertmer, Paderborn) replicating both trackage and operations of the German station Altenbeken in H0 gauge. And here two magazine covers. That is interesting. IN the Repabahn layout, I see Willhelmshöhe and Kasselhöhe, which I'd bet draw their names form exisiting DB stations: Kassel, and Kassel-Willhelmshöhe in the state of Hessen. Though in the prototype, Kassel-Wilhelmshöhe is the more busy station as it is right on the main north-south mainline and all trains stop there, whereas Kassel as a head-end station in the city, may not get the full ICE/TEE/IC type traffic. IN the Repabahn layout, I see Willhelmshöhe and Kasselhöhe, which I'd bet draw their names form exisiting DB stations: Kassel, and Kassel-Willhelmshöhe in the state of Hessen. Though in the prototype, Kassel-Wilhelmshöhe is the more busy station as it is right on the main north-south mainline and all trains stop there, whereas Kassel as a head-end station in the city, may not get the full ICE/TEE/IC type traffic. "A planet of the solar system beyond Pluto and Dave (presumably the 11th planet). ALF convinces Brian to add both Alvin and Dave to his science carnival project. ALF claims to have nearly hit Alvin on his approach to Earth. Another astronomical object on ALF's galactic atlas is known as Alvin Heights, although it is unknown as to whether this is another planet or a moon of Alvin." "An astrononmical object near the planet Alvin, which is the tenth planet from the sun (under the old system in which Pluto is also classified as a planet). Willie notices it next to Alvin on ALF's galactic map. It is unknown whether this is an additional planet or if it is a moon of Alvin." "Schnakenhoern", a free-lanced North Sea port switching layout. The disappearing siding represents the connection to the "outside world". A nice Marklin layout mentioned in Stummis forum in May 2016. Apologies if already posted elsewhere. Click on any line to open photo galleries. Loco depot: 80 x 120 cm analogue M track layout in kitchen table with controls in drawer and loco and station ambient noise via sound generators. Very cool idea, AK. Super. Peter. Large super-detailed K track layout without a single turnout. It is a dogbone with an extremely long main line. Each mountain contains a helix. Electric locos are fed via the catenary and don´t dispose of pickup shoes. Up to 20 trains can run simultaneously one after the other - like the prototype. Helixes serve as buffer. Besides off-the shelf Maerklin locos, the gent is running converted two-rail locos. The latter run well on normal track, but are sometimes cumbersome on turnouts. Further he experienced troubles with shadow station turnouts in the past. Therefore this radical solution. Ok, not Maerklin, but H0. And the multiple use of return loops calls for "three-rail" Maerklin to ensure short circuit-free operations. A central helix well distributes trains to three different layout segments. Oh, that is clever. First time I think I have come across a multilevel European layout along the lines of what the Americans tend to do. From Denmark, the country known for urban sprawl. Now honestly, I like the concept. Excellent site, thanks for posting the link. I have known about the G&D for a long time, but had been unable to find a copy of the book. I do have a not that terribly good VHS tape of his layout. I think I will have to follow the Amazon links and get the book and DVD. And the naming of the Kimchi gasworks indicates that Allen did not lack a sense of humour either. A Marklinist tries his luck on the small NOCH layout guidebook "Familien-Hobby Modellbahn" on 190 x 105 cm. I like the artsy landscaping approach: reduced to the maximum. Yes, "Wow" can be said to describe that layout. Really enjoyed the scenery for being so simple and focus on the mountains and bridges and tunnels. I didn't see quite how he prevents accidents on the line from one train catching up with the train in front. On a few occasions a train would stop for a few moments and then go again. I wonder whether that was block control. 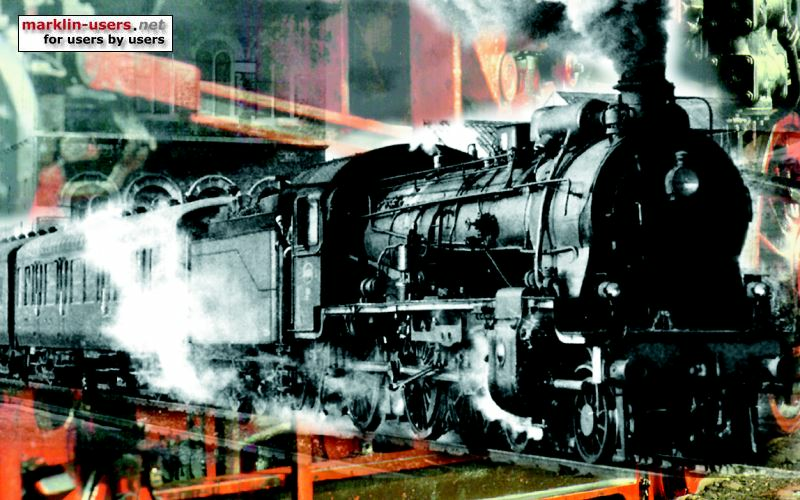 Maybe all trains are set to travel at the same speed, but wouldn't it be nice if they stopped at the station ? Anyway, thanks for sharing. I enjoyed watching the whole video ! What a vast array of layout artistry! 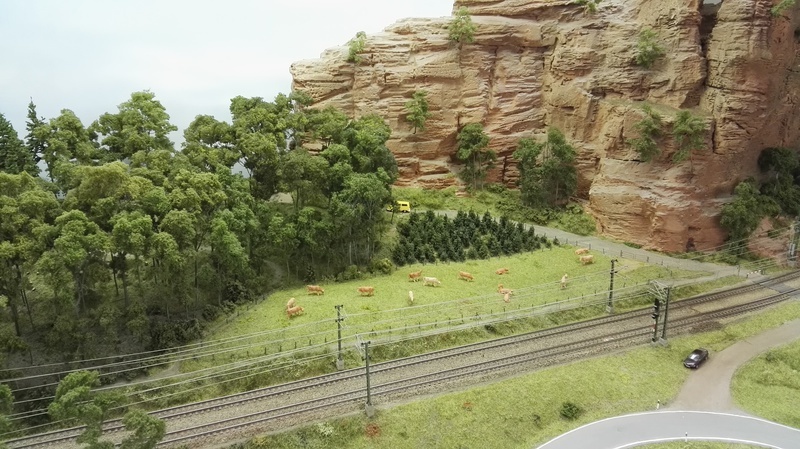 Compact demo layout by Maerklin factory on the occasion of 2012 "Modellbahnfreunde Senden e.V." exhibition. No track plan found. Note the convincing mountain valley scenery on limited space. Bernhard Stein’s “schönste Modellbahnanlagen und Dioramen” © 1989 [published by Franckh’sche Verlagshandlung, Stuttgart], pp. 52-56 HO-Schaufensteranlage im Winterkleid (Store Window in Winter Dress). The dimensions are 1,80m depth on the "side" x 1,65m length on the mountain scene + 0,92m length on the leg for the endbahnhof. The layout plan is a basic oval (the bridge in the background) half of which is hidden, connected to the endbahnhof via a pair of switches just inside the front tunnel and the right-hand rear tunnel portals. The other branch of the front tunnel switch goes to a hidden siding which opens in the back of the alpine area for changing out the trains. Th elevations are 0,0 at the front at the creek bed, +6 for the endbahnhof and +16 for the oval tunnel route. This allows for two trains to run, one on the oval and one back and forth on the hidden siding-to-endbahnhof, then moving the one on the oval the endbahnhof and back again. Quite good action for a demo and for play value as well. I have not mastered the fine art of scanning from a book and posting the plan, so I tried to describe it as best I can. This page was generated in 0.970 seconds.